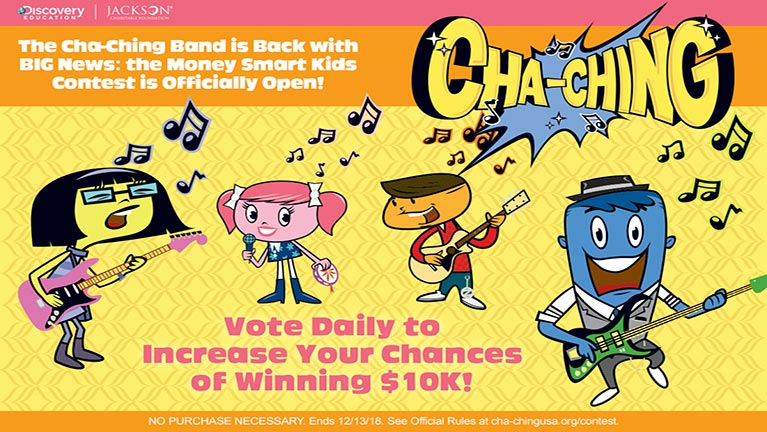 Engaging Music Videos— Helping children learn money management concepts with lively cartoon characters from the Cha-Ching Money Smart Kids!band. Storylines spotlight the importance of earning, saving, spending and donating, and help reinforce healthy money habits. Classroom Activities— Providing K-6 educators with standards-aligned activities that pair with music videos to teach students how to be money smart. Educator Guides— Enhancing educators’ background knowledge of financial literacy to better equip them to facilitate the classroom activities. Family Activities— Offering parents, families and communities helpful tools to teach their children how to be money smart. Launched in April 2017, these resources are available at www.cha-chingusa.org and through Discovery Education Streaming. For more information about Discovery Education’s digital content and professional development services, visit discoveryeducation.com. Stay connected with Discovery Education on Facebook, Twitter,Instagram and Pinterest @DiscoveryEd. The Jackson Charitable Foundation, the charitable-giving arm of Jackson, is a 501(c)(3) private operating foundation. Its mission to provide educational programming to increase the financial knowledge of Americans, reaches more than 1.5 million people annually. Follow the Jackson Charitable Foundation at jacksoncharitablefoundation.organd on Twitter at @JacksonFdn.